Earlier this month the annual Brandz Top 100 most valuable brands 2015 report was released. Topping the list, and by some margin, was technology giant Apple with a brand value of US$247b. Valued at US$29b Toyota is rated the most valuable car maker in the world, coming a relatively lowly 30th in the top 100 listing. Surprisingly, only six auto makers made it into the top 100: Toyota (30), BMW (34), Mercedes-Benz (43), Honda (78), Ford (80) and Nissan (93). Rounding out the list of top 10 automotive brands are Audi, Volkswagen, Land Rover and Lexus (see more detail in table below). The Brandz listing has been published 10 times now, with Toyota ranking first for automotive brands eight times and second two times. For our Australian readers, four of our local brands to make it into the top 100: Commonwealth Bank (48), ANZ (59), Telstra (82) and Woolworths (88). The full report can be accessed from the WPP website. 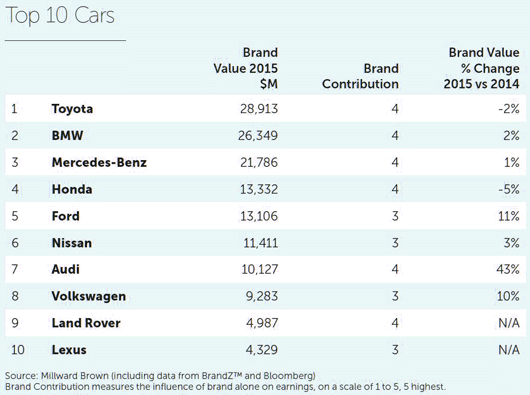 Toyota retained the top spot as the most valuable automotive brand in the BrandZ™ Top 100 Most Valuable Global Brands report 2015. Toyota’s brand was valued at $28.9 billion (approx. £18.8 billion) and maintains its top 30 position in the all-sector ranking. In the 10 years since the BrandZ™ report was first published. 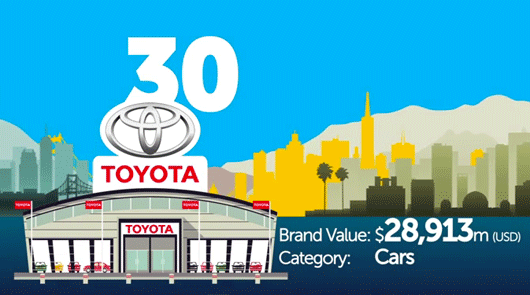 Toyota has been crowned brand value leader in the automotive sector eight times, and second on two occasions. According to the report, although automotive sales improved in some regions, they remained below pre-recession levels in others, adversely impacting overall brand values. In contrast, global sales for Toyota in 2014 increased by 2.5 per cent to 10.2 million units, which contributed to the company’s brand valuation in this year’s report. The report details some of the challenges faced by the auto sector, including the increasing difficulty that auto makers face in differentiating their product ranges, and the waning interest in car ownership from the ‘millennials’ consumer group. The BrandZ™ Top 100 Most Valuable Global Brands report, commissioned by WPP and conducted by Millward Brown Optimor, surveys some two million consumers in more than 30 countries.